It is not surprising that sometimes dog owners get a bit frustrated, trying to work out exactly what is the right dog food they should be feeding their beloved pooch. We have foods for different age groups, others which depend on how big your dog is, and some which target specific ailments, and all that's before you have even considered which flavor your dog likes. Wouldn't it be easier if there were a dog food which covered most of those bases? Thankfully, there is, with this dog food from Canidae, so if you are curious to hear more about it, read on. Whilst some of the major dog food companies have been around for nearly a century, Canidae is a relative newcomer, with its co-owners having first started selling their products door-to-door in 1996. Since then they have grown significantly with a state-of-the-art production facility in Texas and a network of independent and family-owned farms from which they purchase the natural ingredients used in their pet food recipes. The Canidae All Life Stages Dry Dog Food is formulated from veterinarian guidelines so that it has the highest possible levels of nutrition suitable for dogs of all ages. It is available in bag sizes of 5, 15, 30 and 44 lbs., and contains tasty ingredients like chicken, turkey, lamb, and fish. 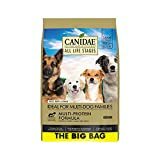 Normally at this point in a dog food review, we would be explaining what size of dog it is suitable for, and the age range of the dogs who will benefit from it, but with this dog food from Canidae, that is redundant. The reason is that this dog food is suitable for puppies, adults, and senior dogs. In addition, it doesn't matter what size your dog is because this is for all sizes too. The picture of the three beautiful dogs on the packaging illustrates this perfectly. First, you have a large German Shepherd who has a few gray whiskers, so they're obviously the senior one of the three. Next, an adult Collie in the prime of life, and a finally a Golden Labrador puppy. We hope you'd agree that just about covers every size or age imaginable, and although that's only three breeds, this food is suitable for all breeds too. If you have only one dog, this is great because you can keep your dog on this food from its early years through to its later ones, but it is even better news if you have more than one dog. Regardless of each dog's size or age, you can use just this food, instead of needing two, three, or more different dog foods on the shelf, and then having to open all of them each dinner time. One other group which you may be interested to know about is pregnant or lactating females, which this food is also suitable for, and there are many brands which can't say that. As we mentioned above, you can order this in four different bag sizes, and obviously that is what you receive. However, it's what in the bag which is of the utmost importance and by that we mean the ingredients. The primary ones are, chicken meal, turkey meal, and lamb meal, plus there is a plethora of vegetables, grains, seeds, and fruits, many of which come from small independently owned farms in the USA. On any review of a dog food, the primary thing we need to look at is the nutritional value of the ingredients, albeit the fact that this can be used for dogs of all shapes, sizes, and ages gives it a huge advantage right up front. The basics are that it’s a dry dog food which is supplied in bags of between 5lbs and 44 lbs. The primary ingredients are chicken, turkey, lamb and fish meal. These have been made from clean skin and flesh, and not bone or entrails which have no nutritional value. Nor does it contain soy, wheat or corn, which some dog food manufacturers use to bulk up their foods. Additional ingredients include flaxseed, sage, cranberries, sunflower oil, papaya, and it even has pineapple. All of these help your dog's digestive system, immune system, skin, coat, teeth, and bones to be as healthy as possible. This is probably one of the easiest dog foods to serve to your dog that exists. There's no mixing, nor having to swap brands as they grow. Simply measure out the correct amount based on their weight, age, and level of activity. The back of the bag has a handy chart which tells you the right amount ranging from very small puppies who need 0.5 cups, through to large puppies who get a whopping 6 cups per day. If you are feeding a pregnant female then you are advised to increase the amount you feed them by 50%, and if they have had their pups and are lactating, then they may need up to three times their usual amount. If your vet has recommended that your dog's calorie intake be reduced or regulated then you can do so, on the basis that 1 cup of Canidae's dog food is the equivalent of 468 calories. Finally, to transition your dog from their current food to this Canidae one, do not simply change it up completely in their next meal. It is recommended that you do it gradually over a period of about a week to 10 days by reducing the current one and increasing the new one each day. If you love the idea of an ‘all life stages’ dog food but your dog isn't keen on dry dog food, then an excellent alternative to this one would be Canidae's All Life Stages Canned Dog Food. This comes in packs of 12 cans and has all the nutritional benefits that the dry food has. The variations available are chicken, lamb, and fish, lamb and rice, or chicken and rice so there are plenty of flavors for your dog to enjoy. We are highly impressed by Canidae's ethos in relation to producing nutritional dog food, and using as many natural, and locally grown ingredients as possible. This has allowed them to create a dog food which can be fed to dogs of all sizes, ages, and breeds, which means that if you're a dog owner, you don't have to keep switching dog food, which is good for you, but even more beneficial for your dog. For those with two dogs or more, it is ideal because you can feed all your dogs with the same nutritious dog food, whether they are big or small, old or young, and regardless of their breed. How convenient is that?